everything clearly on how the techniques, tools, and colors are used to create a stunning masterpiece. These techniques can be easily used for any back piece tattoo. Learn how to bring it all together with the International School of Body Art and Gary Gray Jr. Session 1: To begin we explain why & for what reasons they designs were chosen. Then we show how then stencils were made and how to apply them. After the back is measured and marked, Gary applies the stencils and begins tattooing the outlines of the Oni mask, the tiger and the waterfall & the koi fish & warrior scenes. Every needle is explained throughout this entire session and all sessions on this DVD. Every color used and why. Every technique and how master that technique. Session 2: In session two we sketch on the background with a sharpie for you to get a general idea of how to accomplish this feat with any back piece tattoo. Gary then bloodlines and explains in detail every step of creating the background and why. Session 3: In this session we show the techniques of shading used for the entire background. We show and explain in detail how to create the same stunning effects, several different ways. 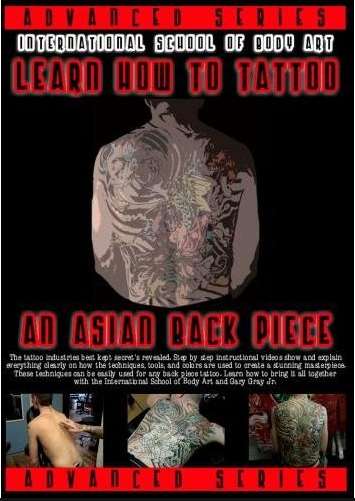 Creating a master back piece with traditional shading and colors is a must to know!